This sweater, when worn under a jacket, is easy to confuse with Sam’s Brown Long-Sleeved T with Grey Sleeve Stripes. In Home (1x09), he wears it again at the end of the episode when they say goodbye to Missouri. In Scarecrow (1x11), Sam wears it when seeing Emily off at the bus station with Dean at the end of the episode. 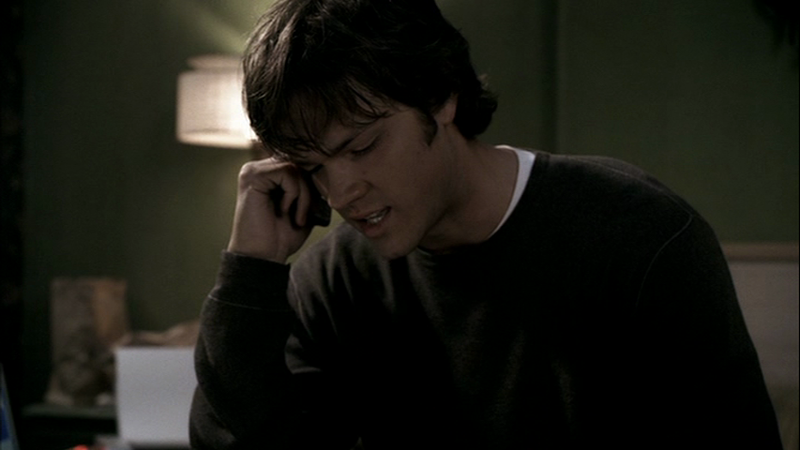 In Faith (1x12), Sam wears it when he is in his motel room, trying find a way to save Dean and get in touch with their Dad. In Shadow (1x16), Sam wears it for the entire episode (when he is not in costume). It gets a bit bloodstained.